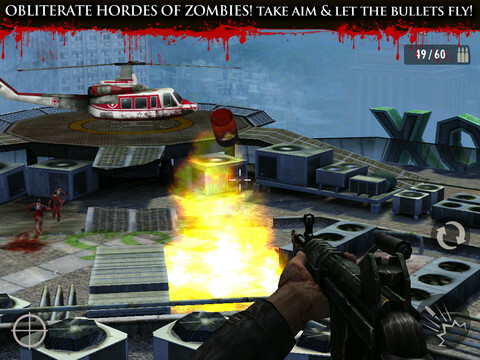 Contract Killer: Zombies or CK Zombies is a free game for the iPhone and iTouch that can be found in the App Store. The app itself received a lot of positive feedback from fans despite the fact that it was free. I had to try it to see what that was all about. Glu Games Inc’s CK Zombies for iOS is actually not that shabby. 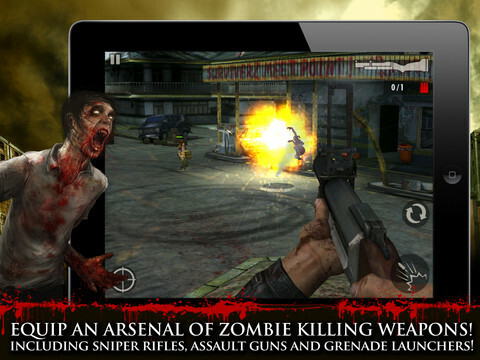 The app is a very simple shoot the zombie game. But instead of the average tap the screen, it uses a control pad to aim, shoot and reload button. Even though this doesn’t take advantage of the touch screen, it makes the game so much more challenging. Because the character that you use is in a wheel chair (cheap trick to take out movement in my opinion), you spend each mission defending your allies while they scavenge or protect. Plot is like any other zombie apocalypse story; survive. Shooter, the main character which you play as, is a handicap on a wheel chair as I’ve already said earlier. You save this girl, and you run around doing missions like, salvage items, collect gas, and help survivors get on a helicopter to safety. But like any other zombie movie, that helicopter probably goes to an over ran base of zombies anyways. The graphics are very well made, and the music is awesome, although limited. The game play is frustrating at times but feels worth it when you start to get used to the controls and head shot more. CK really plays off the whole dreadful zombie apocalypse with the music, and environment feel of the game. Although some of the lines in the game are pretty corny, like how shooter first introduces himself, but it’s well worth the download. Some things I found a little annoying were the missions. They’re really limited and you really end up doing the same thing. There are only so many maps in the game. I have to go save this family under a bridge while later on I have to go steal food. There about a million missions like those two, all taking place on the same map. Another thing which needs a little fixing is the currency needed to buy a new weapon. Each mission gives an average of 250-350 and a gun that is slightly better cost six grand. They should either lower the prices of weapons, or increase mission rewards. In the other hand, I can easily over look all those flaws because CK Zombies is a free app. Yup I said it, it’s FREEEEEE!!!! For a free game, they charge extra money if you want to spend actual dollars on in game currency. But putting that aside, the game does really well, and isabove average for your free app. You should definitely check this game out if you’re a shooting fan. AppSafari review of Contract Killer: Zombies was written by Vincent Tam on November 4th, 2011 and categorized under Action, Adventure, First Person Shooter, Games, iPad apps, Universal. Page viewed 5367 times, 1 so far today. Need help on using these apps? Please read the Help Page.